Hello, Pack Parents. 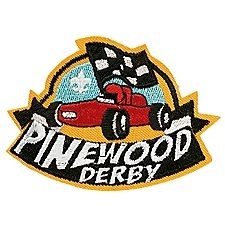 Pinewood Derby week is finally, here! Is your car ready? We wanted to provide some reminders and detailed info for how Setup Night and Race Day will progress. If you know you will NOT be joining us on Race Day, please reply to this message and let us know. It will keep us from holding the start of a race awaiting your arrival. We will setup the Legion Hall and the track beginning at 6pm on Friday night, Feb. 3rd. If you can join us in moving tables and chairs around or assembling and leveling the track, please join us. The more people we have, the faster it will go. Your Scouts are required to arrive Prior To the official registration times for each Rank Group. The goal is to get your groups registered and racing as quickly as possible. If needed, you can arrive and check in early. Please allow 30 minutes to complete the check in process. Those racing in the next group will have priority over those arriving early. Height < 3", Width < 2.75", Length < 7"
Un-modified "Official BSA" Wheels and Axle Pins (BSA must be visable on the sides). Cleanup of imperfections is OK, shaving the wheels to narrow them is not. Cars owners will be given the option to fix any disqualifying issues at back tables prior to handing off for the races. ALL CARS WILL BE ALLOWED TO RACE, but non-compliant cars will not be eligible for any trophies or advancement to the District Race. Once the Cars are handed in for racing, they cannot be handled by the scouts or non-volunteer parents. At that time, each scout will receive a participation patch. Re-Chartering Table - Following Race Check-in, all scouts and adult partners will stop at the Re-Chartering table and sign up to continue to be Cub Scouts into next Fall. Registration is $15 and the Boy's Life Subscription is $12. You can have the fees deducted from your Fundraising Scout Account, if you have the funds available. Otherwise, a check will need to be provided on Race Day. We will also be taking registrations for Weekend Family Camp this May 4-6 as well as Interest Sign ups for District Summer Weekend Camps. Following the Camping Table, Scouts and Adult Partners are free to enjoy the Race Day Activities, the Check in process is complete. Activity and Snack Tables - We will have craft activities and a matchbox car play track setup at the back of the Hall along with a snack table. Anyone attending, including siblings, is free to partake in both. Each Rank's Group Race will begin as soon as all Group members are registered, inspected and numbered. Group races should be concluded within 1 hour of the registration deadline. If you can help either on Friday Night and/or on Race Day, please reply to this message. If you have a preference in job duties, you can include that as well. We hope to see you all this weekend. We are looking forward to an exciting and fast Pinewood Derby!